Lalita Babar becomes first Indian Track Athlete to Reach Olympic Finals Since 1984. Babar qualified on 13th August for the women's 3,000-meter steeplechase finals. She finished fourth in her heat with a national record time of 9 minutes, 19.76 seconds. The finals are scheduled for 15th August 2016. 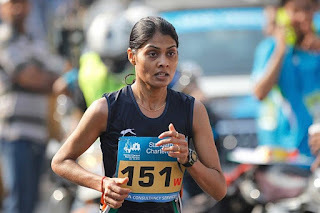 Lalita clocked a national mark of 9 minutes, 19.76 seconds while finishing fourth in heat 2 and progressed to the final, scheduled on August 15, on the basis of being among the fastest six from the rest who did not directly qualify from the three preliminary heats. The top three in the three heats gain automatic qualification while Lalita, hailing from Maharashtra, made the grade as one of the six fastest from among the rest. Lalita, who had won the bronze medal in the event in the Asian Games in Incheon, South Korea, two years ago, in fact finished with the seventh-best time in the heats with the new national record to boot. Lalita, thus, became the second Indian woman to qualify for an Olympic final in track and field after 'Payyoli Express' P T Usha in the 400m hurdles in 1984 at Los Angeles.